Nestled between Little Five Points and Decatur, the Historic Kirkwood district of Atlanta is often forgotten by Emory students. At this intersection of cultures, the edgy, vintage vibes of Little Five contrast the adorable, small-town feel of the homes and shops in Decatur square. Kirkwood, however, is rich in history: it was originally a “streetcar suburb” of Atlanta with streetcars travelling to and from Atlanta two to three times a day. Located only two miles from Emory, Sun in My Belly is on the corner of College Avenue in Kirkwood. Housed in a 1940’s brick store retaining the original “J.A. Bailey & Sons Hardware” engraving across the top of the building, the cafe is easy to miss. The restaurant itself only has a single, square white sign with their logo. The interior, on the other hand, is much more decadent. I was greeted by a hostess standing in front of a rustic wooden shelf decorated with terrariums of succulents. The Friday-morning sunlight streamed through the windows, brightening up the the open dining room and giving Sun in My Belly a family, community feel. Three large couches sit in the front of the dining space, offering a cozy place to eat or sip coffee any time of day. In warmer seasons, Sun in My Belly also offers seating on two outdoor patios. In addition to their cafe, Sun in My Belly is a catering and event planning service, specializing in weddings and large parties. A quick peek at their Pinterest-worthy blog shows how beautiful their events and dishes can be; the restaurant was no different. From the snowflake string lights to the mason-jar centerpieces, Sun in My Belly feels as if it was plucked out of Santa Monica. After being seated, I was served a glass of water in a mason jar. They sure do stick to their aesthetic. I first ordered a coffee — their brew was fruity and bright, just how I like it. I ordered their challah French toast stuffed with honeyed ricotta and fresh bananas. The dish was covered in a sweet, sticky glaze and garnished with powdered sugar and a sprig of mint. It came with a side of maple syrup, but the banana’s glaze was enough for me. Challah bread is thick and fluffy with a hard crust, making it a strong contender in the “which bread makes the best French toast” battle. Sun in My Belly’s challah French toast maintained the bread’s fluffy characteristics, avoiding a dish that felt too dense or heavy, as French toasts often do. The show-stopper, however, was the banana. Sun in My Belly prides itself on an ever-changing menu, serving only fresh and seasonally appropriate dishes. That being said, there is no telling how long bananas will serve as the featured fruit, but they made the meal, tickling my sweet-tooth in just the right way. Aside from the French toast, Sun in My Belly’s brunch menu highlights include shrimp and grits, served in a smoky BBQ sauce with pork sausage, the Kirkwood breakfast — scrambled eggs with bacon and a lavender biscuit — and salads and sandwiches. 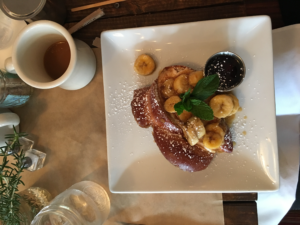 If you are looking for a quaint, delicious and nearby off-campus brunch or study spot, Sun in My Belly is a beautiful destination any day of the week.